I recently went on a trip to Disneyland with my whole family. Since this was the first time I had ever been to the Magic Kingdom, I thought I'd show you what our trip was like. My sister won four tickets from her orthodontist which made the decision to go very easy. 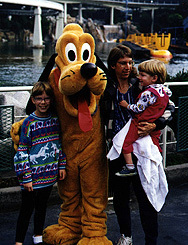 I was free because of my age, so the Monday before Thanksgiving 1997, we packed up the van and headed to Anaheim for a fun-filled day! 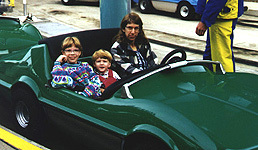 One of the first things I wanted to go on when we got to Disneyland, was the cars. I got a little distracted when I saw Pluto standing there signing autographs on his nose. Mommy took me up to see Pluto. I thought he was very cool. Once Daddy took our picture, it was on to the cars. Wait a minute!! There's Tigger!! I had to see Tigger. Daddy put me on the ground so I could really get up close to him. Tigger thought I was pretty cool. 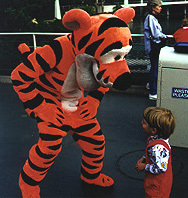 In fact, Tigger thought I was so cool, he gave me a great big "Tigger" hug. As far as I was concerned, the day was a huge success, but I still wanted to go on those cars. Once we got done talking with Tigger, it was off to drive those cars. Finally, we got to the cars. First, Daddy rode with me and my brother and then my sister and Mommy rode with me. I liked riding those cars over hills and dales. While I was riding in the cars with Mommy, my big brother posed for a picture in a car out in front where the line starts. You can hardly tell where the car ends and his red jacket begins. He got that jacket from Grandma and Grandpa. He really likes it a lot. My brother and sister decided that we should go over on the rafts to Tom Sawyer's Island. So we got on the raft and floated over to the island. There are all sorts of neat stuff on Tom Sawyer's Island. Wheels to turn, caves to explore, bridges to cross and forts to run around. I saw ducks on the water and almost went into the river to get closer to them. Fortunately, my Daddy was there to grab hold of my overalls and keep me from going in the drink. I really liked exploring the caves and going over the suspension bridge and barrel bridge. 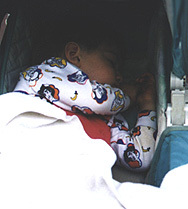 By the time we got back from the island, Daddy was exhausted. Brother and sister wanted to go on the Haunted Mansion. I decided to stay with Mommy as it looked a little scary. I liked the Pirates of the Caribbean even if those two drops were a little scary. Dumbo was pretty cool and so was Peter Pan. As you can see, the day wore me out. In the middle of all this fun, I decided to take a 3 hour nap. Now this is unheard of, since I never take a three hour nap and if I even take a one hour nap, I'm up until 10 o'clock. Well, today, I took a 3 hour nap and when we drove home, I fell asleep in the car before 8:30 dreaming of Tigger and Pluto and the cars. This was a fun trip.